Approaching summer exams during the last year of high school can be a stressful time, believe me! Trying to squeeze in last minute revision, trying to balance revision and homework. I understand! It was right in the middle of this stressful nightmare that an organisation called NCS came into my school to gather recruits. At the time, I vaguely knew what the programme was about, as I had heard and seen a few older students have an amazing summer because of it. But that was it! Phase 1- Residential Trip: We were taken away to a residential centre to have a week of pushing the limits of our comfort zones and team bonding in a series of practical and mental challenges. The week is a time of such excitement and leaves you prepared for the weeks to come as you bond with your teammates. I for example, went away to Shropshire, placed in a dorm room with my new found friends. This type of programme is designed to give the graduates a sense of independence, it’s important to recognise that the NCS leaders and assistants are NOT there to act like teachers, they are there to give you guidance in order for you to have the best summer you possibly can. Our activities were also pretty daring, we tried our hand at zip wire, kayaking, wild survival and even a silent disco to finish. I mean that in itself is a pretty awesome week, right? Phase 3 – Social Action Week: This is the week that you and your teammates will meet with your team leader to plan your Social Action Project, with each person putting in at least 30 hours of their time into the project in order to graduate. You decide on a project that is going to benefit and have an impact on your community in some way and then spend the week gathering ideas, preparing your presentation and contacting local businesses to ask for the involvement or maybe even donations in order for your project to be able to happen. Phase 4: Social action week…in action! : This is when everything that you’ve learnt in the past 3 weeks is put to the test. We met with our team to get all our final prep done and it really is ‘all hands on deck’ during this week! For my Social Action Project, we decided to opt for something that we all felt passionately about and turned that into our main fundraising event – a charity gig in aid of Suffolk based organisation Outreach Youth, an LGBTQ+ community that help hundreds of young people in the local area with struggles they may be facing. They run entirely from donations, so we felt like it was the perfect cause to raise money for. We got together some local bands, pitched our ideas to the NCS leader and the Mayor of Ipswich who were two people that had the final decision on whether or not, they thought our project was worth investing in…bit like a Dragon’s Den interview! Success – our project was full steam ahead, but of course like with any project, we hit some of bumps in the road. You know what they say, “what doesn’t kill you, makes you stronger” and having a team that stuck together and encouraged one another, we ended up with an amazing project with a brilliant turn out! Our £75 went towards hiring a small community hall for our venue that was accessible to all of the team. We organised smaller fundraising events such as a family fun day, a bake sale and supermarket bag packing for 8 hours in order to fund the rest of the event. In the end, it was all well worth it, as our gig night went off with a bang! We held a raffle and face painting at the gig and at the end of the event raised a huge total of £400!! How amazing is that? So, why did I do it? After a stressful year preparing and completing my GCSE’s, I wanted to make the most of my summer! The entire programme only cost me £50 and for me, NCS was a once in a lifetime experience; it’s left me with so many memories and friends that I’ll remember for a lifetime, why would you want to spend a summer staying inside playing Xbox, when you can be learning about yourself, others and giving yourself the opportunity to open so many doors! To finish and celebrate our hard work, of course there is graduation! 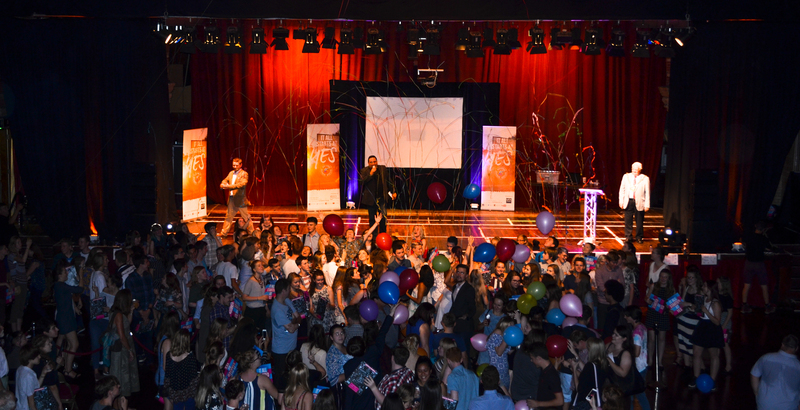 My teammates and I, along with the other teams across the country come together for a night of celebration, including pictures, videos and interviews from previous graduates in how NCS has impacted their lives since leaving school. The beauty of this programme is that you get the opportunity to do it straight after your exams so it helps take away the stress and anxiety you feel awaiting the results. NCS also allows you time to develop skills like working effectively as a team and building your independence and confidence and I believe it is something that workplaces are familiar with and can really stand out on your CV. UCAS even recommend having this on your personal statement, just for extra kudos! So my advice – GO, have an amazing summer like I did, you’ll be thankful you did it. It all starts with a YES! Next Next post: Education or Vacation?